Fall is in the air! The weather is cooling. Sweater sales are skyrocketing. And the leaves are changing colors. I’ve recently been thinking about lessons that can be learned from nature, and in particular, how trees prepare for the fast-approaching winter. I’d like to share with you a few things that I learned. First, a lesson about trees. Every year, in preparation for winter, trees shed their leaves. This is done in order to help the tree conserve water and energy during a season where they won’t have the same access to water and nutrients that they enjoy in other seasons of the year. During warmer seasons, the leaves use sunlight, water and air to help create energy to sustain the tree. But in the winter, because of the dry, cold air, the energy leaves create is less than the energy it takes to sustain those leaves. So, in order to conserve moisture in the trunk and branches, thus protecting the tree, leaves are dropped, the spots where they were attached are sealed, and the tree lies dormant until spring. This keeps the tree alive during a difficult period of time. Now, a lesson about life. There will be many difficult seasons in life. For students, some of those seasons may include midterms and finals. For individuals who are affected with Seasonal Affective Disorder (SAD), that season is literally winter. For others it may be periods of poor physical or emotional health, times of loss, of financial difficulty, or of prolonged loneliness. Sometimes these seasons of difficulty come suddenly and unexpectedly. At other times we may anticipate them and recognize their approach. At such times, it may be wise to follow the example of trees in nature and find ways to let go of certain activities that we no longer have the energy to sustain. This is often difficult. After all, many if not most activities in your life exist for a reason. Do you neglect school work? Work? Church service? Hobbies? Relationships? Scripture studies? Community Service? Meals? Therapy? Exercise? Sleep? I don’t have the answer, because it will be individualized to each individual or family. Determining what “leaves” can be sacrificed for a time is a matter that is best approached thoughtfully. Perhaps you will decide to simplify by making faster, easier meals. Maybe you will feel that you should say no to invitations to some social activities. Maybe you decide to only put in sufficient effort into your studies to earn a C rather than an A. Maybe you think to take your kids out of an extracurricular activity for a while. Maybe you ask for fewer hours at work. Maybe you will decide to give up time spent on social media. But, as you consider what “leaves” you may be able to let drop for a season, be careful to not confuse leaves for roots. The root system of a tree plays a vital role in sustaining a tree. It is a store-house for food reserves. It absorbs and transports water and minerals from the soil to the trunk and branches. It also anchors the tree. Even though it becomes necessary for a tree to drop its leaves in winter, a tree never detaches from its roots. We likewise have sources of strength that nourish us and anchor us. To quote the six-fingered man from The Princess Bride, “If you haven’t got your health, you haven’t got anything”. Your physical body matters. To say that you are too stressed to eat or sleep or exercise is like saying that you are too sick to take medicine. You may need to adapt some patterns around these activities, but to drop them altogether is going to deplete you of the energy you need to sustain you when times are tough. Social science and lived experience teaches us that we need other people! Don’t cut everyone out of your life when life gets hard. Perhaps you will need to become dormant in certain social circles for a time, but maintain some meaningful connections. Have someone that you can talk to and laugh with and confide in and seek counsel from. If you are married, turn to your spouse as a source of strength and support and be a source of strength and support to him. Connect regularly. Have fun together. Make time together a priority. It can be tempting, in busy times, to let go of spiritual rituals. Whether your worship consists of spending time in nature, meditating, or attending church services and worshiping through prayer and scripture study, there is a rejuvenating power to be found in the spiritual aspects of life. Take time to do things that refresh you. Perhaps your self-care is rooted in one of the other roots. Perhaps you exercise for self-care. Perhaps you love having late-night dance parties in the kitchen with your roommates. I find myself refreshed by conversations with close friends and going thrift store shopping. Find something that helps rejuvenate you, and take time to “sharpen the saw”. 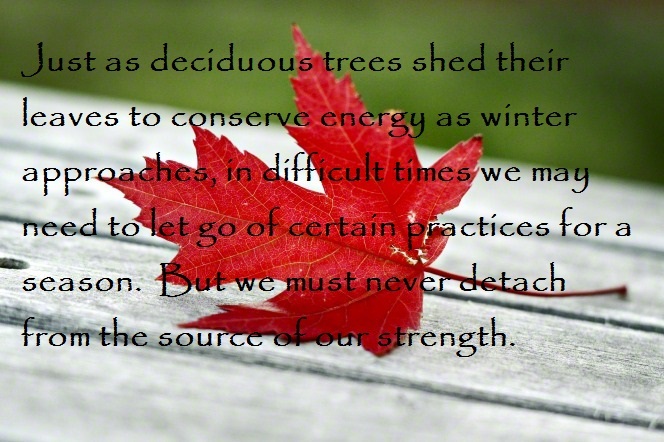 Just as trees shed their leaves to conserve energy as winter approaches, at times in our lives it may become needful to let go of certain practices for a season. But we should never detach from those things that give us our strength.